Mission Dolores Academy is a participating school in the Catholic Youth Organization Athletics league, allowing our students to compete with schools in San Francisco, Marin, and San Mateo counties. Our athletic program is a non-cut program, which means everyone who wants to play, gets to play! Our program is tailored to every level and background; it is perfectly fine if your child does not know how to play the sports they are interested in. Volunteer support is an integral part of our sports program. 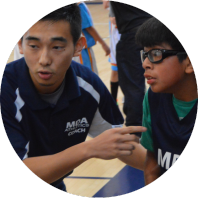 If you are interested in coaching or assisting our coaches during practice or games, please contact Steven Ta at stevent@mdasf.org.